Keep your costume traditional by choosing a classically spooky look. Be inspired to cause a fright on the night with these ghastly outfit ideas! Sometimes the ‘bare bones’ approach is the best. 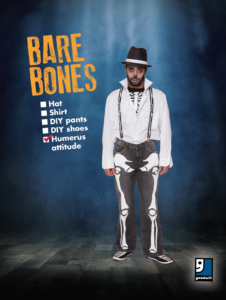 To keep it cool as a jazzy skeleton, you need a white shirt, braces, and a trilby. Then it’s time to get crafty! Grab some black pants/slacks and a black t-shirt and draw your skeleton on with fabric pens or some stick-on white vinyl. Don’t forget the face paint to give someone an extra scare! Nothing is creepier than a ventriloquist’s dummy that comes to life. Make people jump by bringing a living doll to the party! 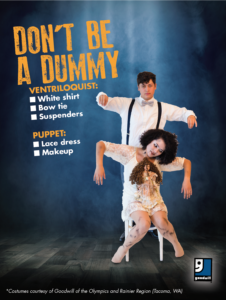 One person needs to dress as the puppet master with a bow tie, white shirt, and suspenders, and the other comes dressed as a Victorian doll. Want to make it even creepier? Bring along a real vintage doll with some gory fake blood. There’s no Halloween costume as classic as a vampire. 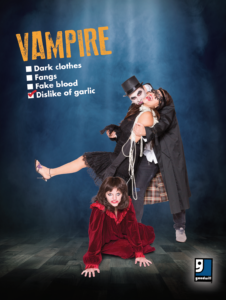 Pale face, fangs, cloak, no reflection… If you add some fake blood and bring along a victim, people will be scared to stand next to you at the party. You better get practicing your evil laugh! TV programmes such as The Walking Dead and The Santa Clarita Diet have made Zombies a popular choice for Halloween. 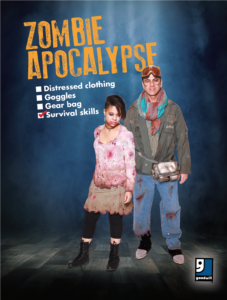 Be different by dressing up as a zombie apocalypse survivor. To be a successful survivor, you’ll need some fake blood, dirty clothes, some sturdy boots for coping in any terrain and, most importantly, a bug out bag. 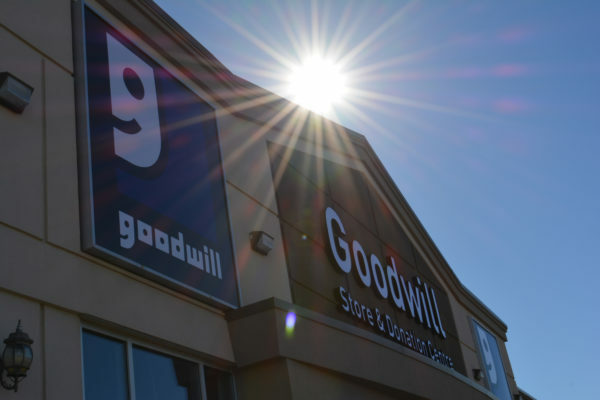 Whether you want to be a classic witch dressed in black or love the coloured costumes from the movie Hocus Pocus, Goodwill is a great place to find long, dramatic dresses. 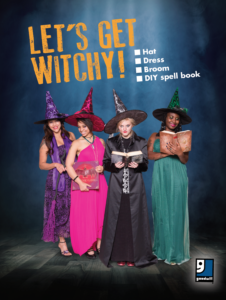 While you’re there, why not pick up an old book to upcycle into a spellbook and, of course, the iconic witch’s hat! 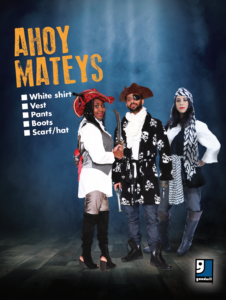 Transform quickly into a pirate matey with one visit to your local Goodwill. Look for white shirts, waistcoats and long boots. Adding scarves, belts, swords and maybe even an eye patch will complete the look. We’ll give bonus points if you can find some skull and crossbones accessories! Arrrr!